One of the biggest problems people have with decision making is a desire to know too many facts, their theory being that if you have enough facts the decision will make itself. Other manages are instant decision makers. They don’t need to know every fact first. They accept that they are going to make wrong decisions and are confident enough in themselves to know that in most cases they are going to make the right one. Decision making is (mainly) an instinctive process, rather than an analytical one. No amount of research reports can change that. The danger is that the more data people have to examine, the more likely they are to underestimate the importance of instinct. Decision making is taking the analytical data, facts, figures, etc. and converting them into sensory perceptions. If you eliminate the ‘feeling’, you will not make very good decisions or you will not make them at all. Some managers ignore the facts completely and some others use them to justify convenient solutions rather than the one the facts support. Needless to mention that it is difficult to make good decisions based on self-assuring or self-justifying bad conclusions. The best use of facts (i.e. marketing date, reports, surveys, other people opinions, etc.) is not their literal reading but what they may indicate. What do the facts really indicate about trends, biases, conflicts, opportunities? The most useful decision-making information may lie beyond the facts. Don’t be restricted only by what you already know. Many executives are very depended on old facts or are basing decisions on what worked 20 years ago. Sound business decision-making is a constant process of staying current, of realizing how new information can change old decisions, of foreseeing the future! Decisions are partly emotional. Therefore, it’s good to let them settle in for a period of time. Are there any obvious considerations that haven’t been considered? If none occur in the first (let’s say) 24-hours, this means they will probably never occur (or by the time they do it will be too late). If you immediately start a second thought, a decision you have made it will most likely prove a bad one, not because it was the wrong decision, but because you underestimated its chance for success. A lot of questionable decisions have worked because the people who made them were determined to make them work, and a lot of good decisions have failed because the people who made them never got over their doubts. Rock-paper-scissors - the ancient children’s game - has determined the outcome of millions of extremely important decisions. 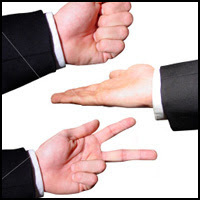 No one is saying you should use rock-paper-scissors to determine your next business decision. But think that some of your competitors may make decisions that way.